When I was a young girl, I loved music so much that I would listen to my favorite songs on the radio, sometimes taping them to play back, and then write the lyrics down in notebooks. "Mighty Love" and "Could It Be I'm Falling In Love" by The Spinners are two love songs that I remember as particular favorites. 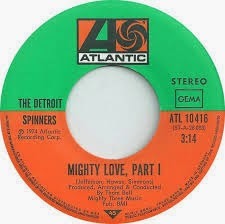 "Mighty Love" was released in 1973, and made it to the Top 40 in 1974. The Spinners were a group of friends from Michigan, near Detroit. They debuted at the Apollo Theatre, but did not find great success in the 1960's. They worked at Motown - but in desk jobs and support staff positions. Their success came in the early 1970's, and they were everywhere on the radio during the mid-'70's. I heard this song over the weekend on the radio and have been thinking ever since how much I enjoyed it. I hope you do, too.